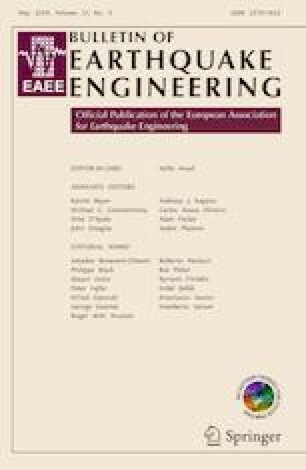 The need for proper nonlinear modelling of the structural damage resulting from strength and stiffness degradation observed at different levels of seismic intensity is essential in a comprehensive response assessment of a structural system. A nonlinear model based on plastic and damage mechanisms is presented here for seismic analysis of inelastic structures. To begin with, piecewise linearization of the initial backbone curve is carried out, each segment being defined by an in-parallel combination of elastic-perfectly plastic and elastic-softening damage mechanisms. The deterioration of the plastic and damage mechanisms is controlled by a damage index, which involves an accumulation rule of a damage parameter. Then, simulation of structural components is used to exemplify the reproduction of some hysteretic models with different types of degradation. Comparison with experimental results is subsequently carried out to calibrate the proposed model. Cyclic histories, with variable amplitude, are also considered to illustrate the effects of the plastic-damage mechanisms on the hysteretic response. Finally, nonlinear seismic analysis of a single-degree-of-freedom system, equivalent to an r.c. framed structure, is used to highlight the capability of the proposed approach in order to generate the capacity boundary curve starting from the initial backbone curve. The present work was financed by Re.L.U.I.S. (Italian network of university laboratories of earthquake engineering), in accordance with the “Convenzione D.P.C.–Re.L.U.I.S. 2019–2021, WP15, Code Revisions for Isolation and Dissipation”.